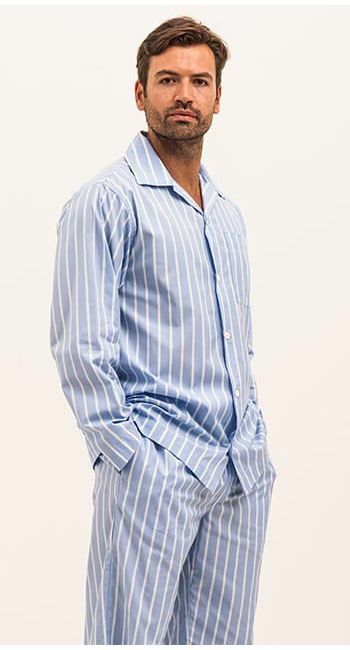 One of our finest cotton pyjamas in the men's collection. This two fold blue and white stripe cotton is woven from a luxurious combination of Egyptian cotton and extra long staple Pima cotton. Due to the fineness and extra long length of its fibres, Pima cotton is considered to be one of the finest qualities of cotton. Available in two leg lengths. Tall size fits inside leg of up to 36" and has an extra inch on the sleeves. 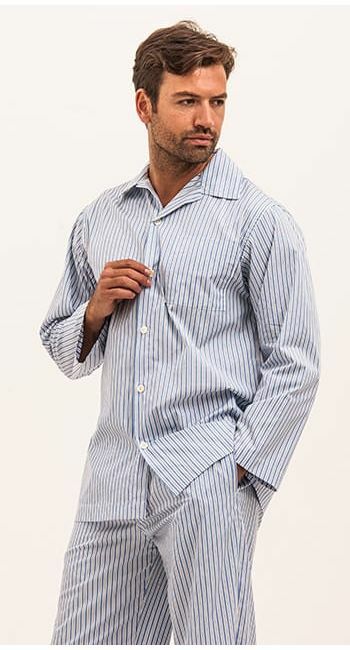 Like all of our pyjamas these are made in Britain and finished with real shell buttons. Matching nightshirt available.